I'm writing to you from France, where I live, about a 1988 Volvo GL (European model) that has me perplexed. This summer the upper connector on the radiator exploded, leaving me stranded. When I realized what had happened, I went to shut off the engine. Before I could turn the key, however, the engine cut off by itself. I had the car towed to my home, where I changed the radiator. Since then, the car has refused to start. It turns over, but will not start. I replaced the fuel relay (and main fuel pump), and I'm getting fuel in the return fuel line. There was a weak spark, so I checked the coil's resistance (which was OK) and the distributor. Since then, however, the coil has died (I fear that in later rechecking the coil, I inadvertently touched one of the posts to a car fender, grounding it, (and primary resistance is 3 ohms and the secondary resistance is 0)), and I also fear that the Hall impulse sensor in my distributor is bad. I'm going to replace the coil and Hall sensor, but I have another problem, involving the ignition wiring, which is why I'm writing. My father-in-law, who had purchased this car new, had someone install an after-market alarm in it. I suspected that maybe it was somehow related to the non-starting problem (I've since changed my view to believing that water traveled down the upper radiator hose, when the upper hose connector failed, and ran on top of the distributor, causing the Hall impulse sensor to fail), so I began removing this alarm system. I disconnected the alarm sensors and bee-hive of wires that were connected to it. I'm stymied, however, by a blue wire and a brown wire that were connected to the alarm and which then passed through a grommet in the firewall. 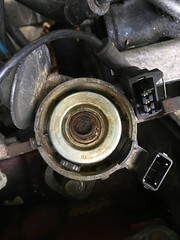 These run through a black rubber tube to the ignition coil (see photos). The brown one is connected to two blue wires that run to what appears to be a combination ignition control unit/power stage unit (I say "combination," because I have not found a separate ignition control unit on this vehicle) that is on the fender-well beside the car's battery. The blue wire is connected to two blue wires that connect to the coil's +15 terminal. Now that I've disconnected the alarm, I have no power at the coil. 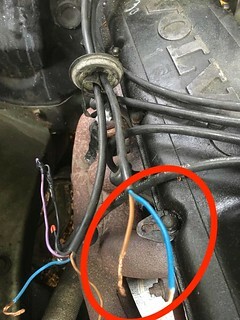 I suppose that is because of these two disconnected wires (the blue and the brown wires that were connected to the alarm, and which obviously were used to disable the coil to prevent the theft of the vehicle). I don't know if this coil was the origin of my non-starting problem, whether it was the old alarm system or the Hall sensor in the distributor. I would appreciate if you could tell me how my coil was hooked up before the alarm system was installed, allowing me to put the coil wiring back to how it was originally so that I can get this car back on the road. PS: If I figure out how to post photos, I'll publish some of these mysterious blue and brown wires. Welcome aboard. I want to know what fuel management do you have? From your description it seems like LH2.4 with the ignition amp next to the battery in the left inner fender. But I'm not familiar with the later kjetronic injection setup which might have something like that. I will proceed if it is LH2.4. Then yes there is supposed to be a blue power wire to the coil terminal 15. I would think someone tied the coil wire to a switch or relay for theft protection since those wires go under the dash. Blue also supplies power to the ignition amp in the left fender. For wiring diagrams in print. I would check ebay or the forum classifieds. You can get a green book for your year wiring and have a good reference. There are also wiring diagrams in old Mitchel manuals, the Bentley service manual, and Haynes. Which Bosch Jetronic injection system? Thank you for your welcome to the Forum and advice about checking my fuel injection system. I'm unable to answer, as I'm unsure about whether or not it is the Bosch LH-2.2 or LH-2.4. It is a European model 1988 240GL. A U.S. source for 240 parts led me to believe that it should be an LH-2.2 (1985-1989 240s), but my Haynes manual says that the LH-2.4 Jetronic system was used on 1987 through 1991 models. If I was able to post images here, I would publish a photo of my injection system. 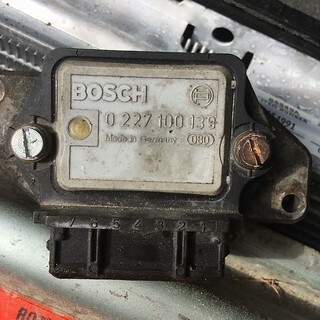 I read also on that U.S. website that the Bosch part number on the Mass Air Flow sensor could provide me with the answer, but I cannot see a part number on mine (or even see where it is located, for that matter). Page 20 shows the ignition wiring. I'd expect it to be similar to the European version. To post pictures, you need to host them somewhere else (flickr, imgbb, etc.) and add the links here. Thanks for your welcome to the Turbobricks forum and for having clarified which fuel injection system is on my vehicle. Thanks, also, for having pointed me towards those wiring diagrams. They've made me realize an important difference in my European vehicle's ignition system: my car's ICU control unit has 7 terminals; the U.S. model 1988 240GL ICU control unit has 10. I'm now better equipped to restore my wiring to a pre-after-market alarm system state. I also now know how to post photos to the forum. I'll have to see if my French village offers any blacksmithing courses that will enable me to successfully remove and replace the infuriating rivets that hold on this sensor. Thanks for your advice. I'm not sure if I'm able to test the hall sensor with my failed coil and the problem that I'm having in reinstalling my ignition wiring after having removed the after-market alarm. I'm thinking that I need to get a new coil and repair the wiring before going to the trouble and expense of replacing the hall sensor. Is there a way, in addition, to test the ICU control unit to make sure that the problem is not with it or, as you mentioned, with the connector? Last edited by Volvo owner in France; 10-18-2018 at 02:43 AM.. Pop off the clips and look inside the distributor. Is there anything under the dust cover? If nothing it's going to be LH2.4. If there is a sensor under the dust cover the engine is using LH2.2 most likely. Thanks for the suggestion about checking inside the distributor. There is a sensor, indicating, as you said, that my fuel injection system is the LH2.2. Now that I can see your pictures, I'm not sure what ignition system you have. The distributor looks like a 3-pin LH2.2 distributor, but the Bosch 139 module is not the normal big Chrysler ignition box used in the USA Volvo LH2.2 240s. Some of the LH2.2 740s used a EZK117 box, and a Bosch 124[?] ignition module. Maybe someone here is familiar with LH2.2 ECU and Bosch 139 Ignition module on a Volvo? A link to a wiring diagram/greenbook would be great. Your fuel injection system is k-jetronic, not LH anything. Here in the US Volvo fans tend to identify our cars in terms of the fuel injection system, i.e. LH2.0, 2.2, 2.4 and extend that designation to the spark system as well, when it is only a pairing chosen for the market. Yours has mechanical fuel injection (k-jet) if it is injected at all. The ignition system is a separate choice. Going over your original post, I suspect the alarm system had an immobilizer feature which served to interrupt the power to your coil terminal 15. This should arrive at the coil from the wiring harness through a solid-color blue wire. Last edited by cleanflametrap; 10-18-2018 at 12:57 PM..
Art, you give me hope that this old gray mare might run once more. I've got to lick this alarm system problem first, however. You're right about a solid-color blue wire arriving from the alarm to the coil's terminal 15 (see photos). The photo of the blue wire and accompanying brown wire shows the bare wires that I pulled through the firewall after cutting them off at the back of the alarm (the four other wires next to them went to the alarm siren that was attached to a front fender well in the engine compartment). 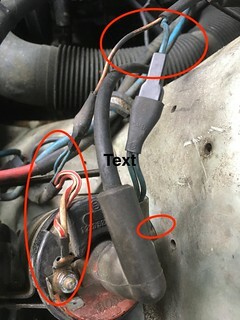 The brown wire connects to two blue wires that run into the ignition control unit. The coil's negative, #1 terminal has two stripped wires that connect to the ICU's No. 1 circuit, which, if an article that I read today is relevant to my vehicle, is the "Output circuit for the ignition coil's switching signal." Tomorrow, I'm going to try to determine which ICU circuit connects to that brown wire. I really need to locate an ignition wiring diagram for this vehicle. All of the ones that I've looked at have been for LH2.2, LH2.4 ignition systems. Now that you've pointed me in the right "K-jet" direction, there is hope. My car is fuel injected, by the way. If you have any leads on where I can find the proper European model ignition wiring diagram, I would be most thankful. Or, if you can advise me on how to connect my coil and ICU the way it was before the alarm was installed, even better yet. Your pictures give me an answer. See where the blue and brown wires from your alarm terminate in some rubber-covered dual terminals at the coil #1 and to a pair of blue wires exiting the black vinyl sheathing along with the white/red wires? Pull off and plug that pair of blue wires with the plastic-covered connector on coil #15. I think that is how it is supposed to be wired. Ah that makes sense. 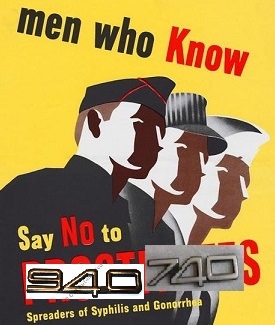 Your engine is version of the B230E which we didn't get over here. The ignition is a setup that we also didn't get here in the US or Canada. There should be a control module for your ignition either next to the window wash tank or under the dash behind the glove box. Not sure where since we didn't get that engine and ignition system. The control module is triggered by the hall sensor in the distributor. Then the control module switches the amplifier in your picture to make the coil produce the high voltage. Look for ignition system B230E on the wiring diagrams. Please post a pic of the engine bay of your 240. In Germany they are all B230F at this year of production. In the UK, and maybe France, they are 3 versions of 4 bangers of a 1988 240: B200E, B230E, B230F and the turbo ones. Without a pic of the inlet manifold we don'the know what kind of engine your 240 is with. The "dust cover " isn't a dust cover, still obligated and should be inside the dizzy. Thanks Art, K-Jet fueling with non-USA ignition makes much more sense (the "couldn't find the MAF comment" should have been the clue). The 139 ignition module connects directly to the distributor, there is no other ignition control box. This means that it's a mechanical advance distributor (spring loaded weights that chance ignition advance as rpms go up). The 139 module will control the dwell time. For USA models, this setup is closest to the k-jet breakerless ignition, but with a small 139 module instead of the paperback book sized control box. You guys are great. Thanks for stopping my futile search for the other ignition control box that I saw identified on the LH ignition wiring diagrams for 1988 240s. Tomorrow is going to be devoted to better understanding this K-jet breakerless ignition. Exactly correct, in my opinion. Thanks, Kay (it's obviously not only the 'guys' who are great on Turbobricks . Here's a photo of my 1987(88?) 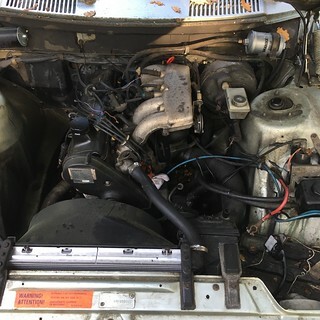 Volvo 240's engine bay. Can you tell if it is a B230-E or a B230-F from this photo? Like cleanflametrap wrote. Check if 12V is at the blue wire with ignition on and even if you turn the key to the start position. Do a short cut between the batteries and 15+ at the coil. If the engine will start now the problem is inside the alarm system or the ignition switch behind the key. At two stroke oil to the fuel if you like to store the car more than 2 month. 1:100 will be good enough. Never use E100/E85/E100 or E5 stuff. Be aware of the alcohol mixed at the fuel. It will kill the fuel distributor.